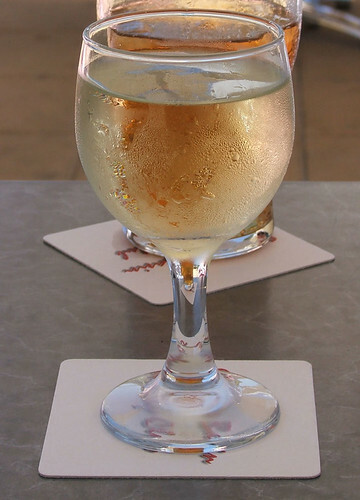 You can make this an etched glass effect, or, by inverting the filter, make it appear as though the shape/type/whatever is moulded in the glass. Because my glass is light, I will be using a black filled shape. If your bottle or glass is dark, the type/shape/whatever, would need to be white. So lets get straight on with it. 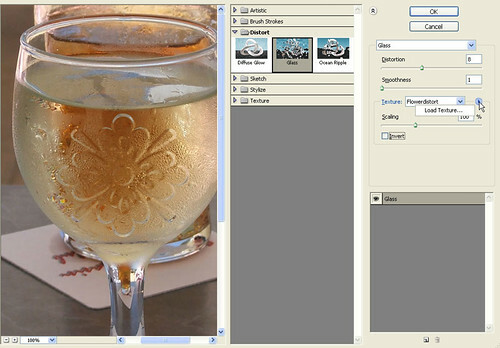 You can click through on my glass image below to get the larger start image, or you can use one of your own. Just remember that any settings I use are relevant to this file 720 X 1000 @72dpi. 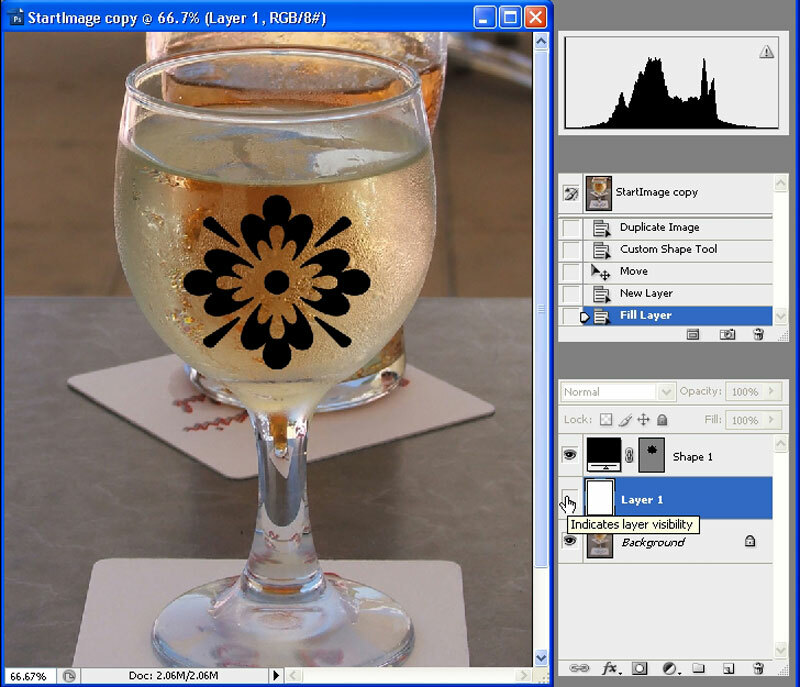 Your first step will be to create a new layer above the b/ground layer and then fill it with white … turn off the visibility of the layer by clicking on the little eyeball icon next to the layer. I’ve chosen the ‘Flower Oranment 2’ which is a Photoshop default shape, and I’ve drawn it on the glass …. see image below. 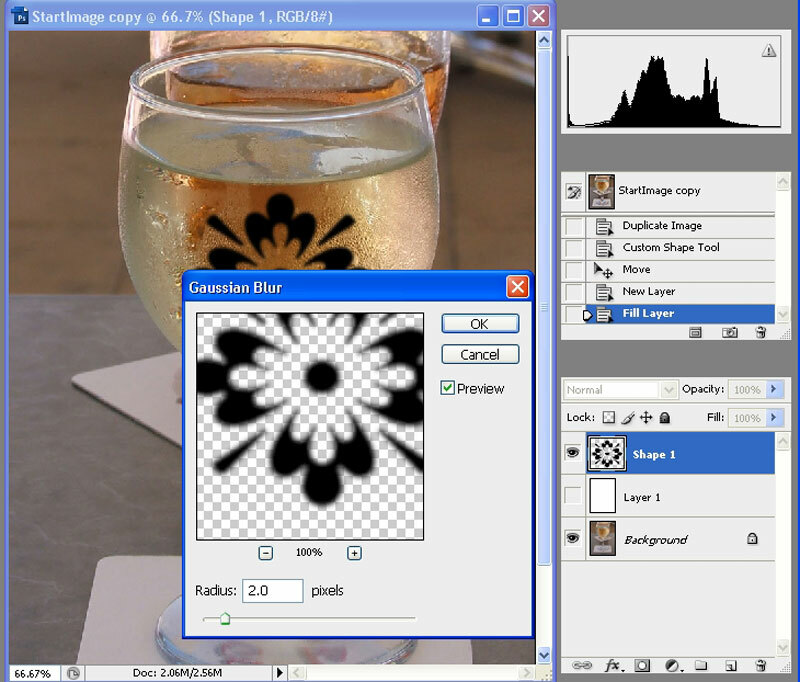 Make sure that you are working on the Shape Layer (or type – making sure the spelling is correct) and go to Filter>Blur>Gaussian Blur, a small dialogue box will appear asking you to rasterize the shape or type, click OK to make that happen and then choose a small amount of blur. 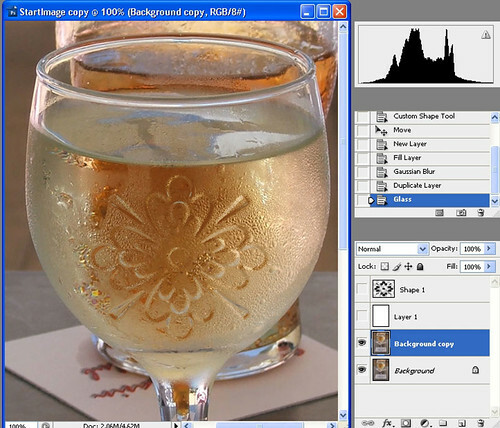 I have used 2 pixels on this particular image … which might be a tad too much …. we’ll see. Next you are going to create a flattened copy of the image and save it to your desktop…or somewhere that you will remember, because we are going to be using it shortly. 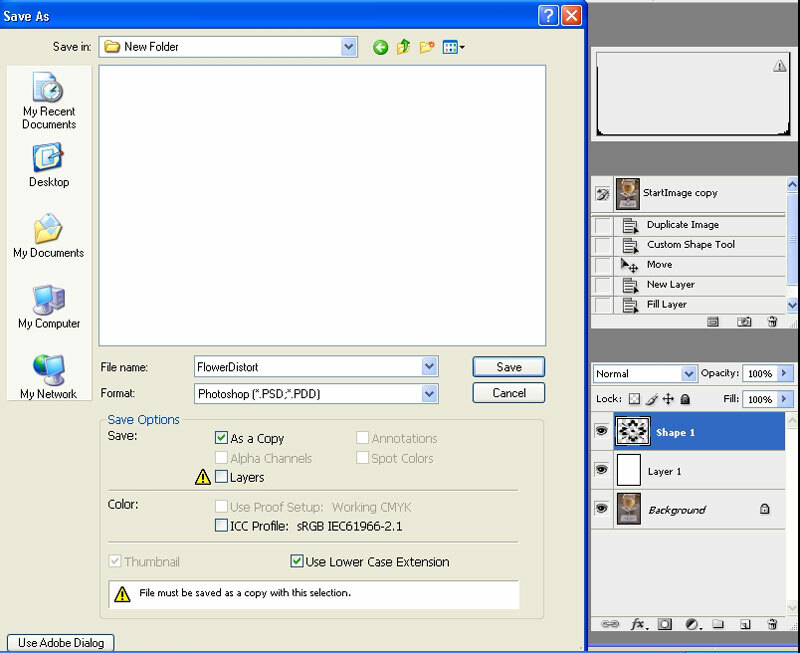 Go to Save As and when the dialogue box appears, make sure that your uncheck ‘layers’ and check ‘copy’ See image below. Now, duplicate the original b/ground layer and turn off the visibility of the shape layer and the layer you filled with white. Working on the duplicate b/ground layer go to Filter>Distort>Glass and the Filter Gallery dialogue box will appear. Look at the right hand side of this box and notice where it says Texture, click on the small arrow and a small box will appear that says load texture, click on this and load the file that you previously saved. As you can see, I called mine Flowerdistort. You can fiddle with the Distortion and Smoothing, but you will have to leave the Scaling as is. You can also check and uncheck the Invert box to see which variation you prefer. Once you have the settings as you like click OK to make it happen. And here is the image with Inverted checked. And that’s it. Fiddle around with the settings a bit till you get what you want, and remember that if the bottle, glass etc., is dark you will need to reverse the colours i.e. the layer will be filled with black and the shape or type would be white.